Starting from v3.3 the Syncrify client is updated automatically when the server is upgraded, provided you are using the service-based client. IMPORTANT Do NOT uninstall and reinstall Syncrify Server. Installing the Syncrify server again will overwrite your existing configuration, including users. We recommend you always use the latest version of the Syncrify server as well as client. The following steps demonstrate how to check if an upgrade is available and apply it. 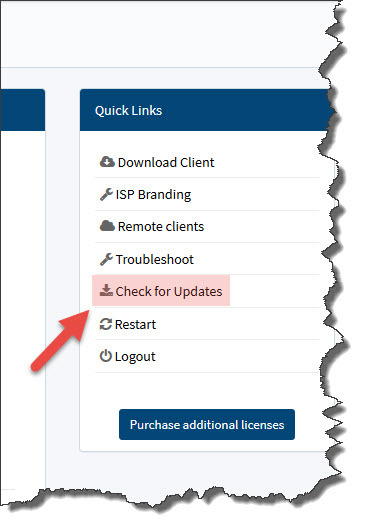 Click Check for upgrades link appearing under Quick Links on the right hand side. See image below. Follow the instructions on the screen to download and install the new upgrade. IMPORTANT: If you have created a branded client using the ISP edition you must recreate this client using the web interface of your Syncrify server. TIP User data is preserved when Syncrify client is reinstalled. 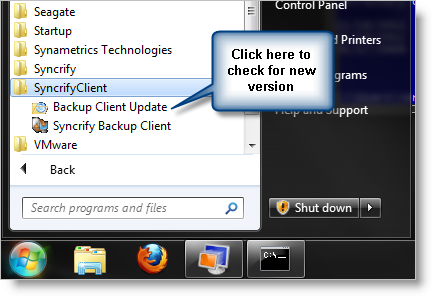 If you are running Syncrify version 3.0 or above, you can click the Backup client update icon to check for new versions.